Address 720 E. Las Olas Blvd. Located in the heart of Fort Lauderdale's famous Las Olas Boulevard, American Social invites guests to come enjoy an endless selection of local and regional craft beers, frozen ""pour-it-yourself"" beer taps, fresh fruit spirits, traditional cocktails and all-American cuisine. Satisfying cravings around the clock, classic American dishes are available for lunch, dinner and late-night snacking. Honoring our country's rich heritage, American Social's warm decor features gas lanterns, original old-Chicago brick walls, and a good old-fashioned handcrafted Ipe wood bar. Also available are our two self-serve beer tap tables where you & up to eight of your friends can enjoy four of your favorite craft beers from the Lazy-Susan draft system in the center of the table - it's like having 4 kegs right at your fingertips! Timeless Life Magazines displayed throughout the interior highlight some of our countries most powerful people and historical moments. The ideal place to unwind any day of the week, American Social features an energetic atmosphere complete with live music and lots of perfectly-placed HD-TVs which make for prime viewing from any seat, both inside and out. 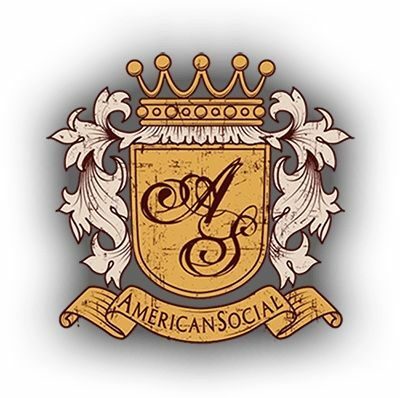 Located in the heart of Fort Lauderdale's famous Las Olas Boulevard, American Social invites guests to come enjoy an endless selection of local and regional craft beers, frozen ""pour-it-yourself""
American Social, overlooking the Miami River, invites guests to come enjoy an endless selection of local and regional craft beers, ""pour-it-yourself""